This year I was fortunate enough to be given a place on the Gr1ps Competition Team for the IBJJF European Championships. 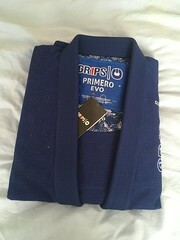 This meant I received a special patched up version of their Primero Evo gi to wear at the event. I already have a Gr1p’s Amazonia female gi which I have mentioned in my gi buyers guide. 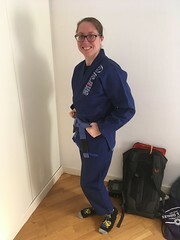 I have also bought and reviewed the Gr1p’s Arte Suave Gi last year so I was already a fan of the brand and very excited to receive a competition gi from them! 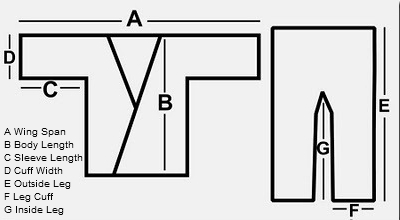 The next obvious step after the competition was to review it for you all. The Primero Evo is apparently their third version of this gi building on the tailored fit of its predecessors but with an added polyester lining for comfort and improved aesthetics. The gi is steamed and pre shrunk for a better fit and as expected its triple stitched and reinforced in all the right place to make this a strong and durable piece of clothing. The jacket is 100% pearl weave. The polyester lining is sublimated providing tastefully detailed artwork. The gi also has simple but effective logos and stitching including a nice touch of the Gr1ps branded ribbon around the edge of the gi jacket. Obviously my gi already had a beautifully bespoke competition team patch stitched on but for anyone buying this gi off the shelf it has plenty of space for club patches. Its a really clean and simple gi but still has a lot of attention to detail throughout. The pants are made from 300 gsm Japanese Twill with reinforcement at the knees. The fastening appears to be standard in Gr1ps gi and is a lovely elastically tubular drawstring that stays tied fantastically. This combined with a 6 loop tying system at the waist makes from a pair of comfortable fitting pants that won’t fall down! Not forgetting that these pants are beautifully tailored down to the ankle. Making those pant grips a little bit more tricky, creating a slim silhouette and staying competition legal. A difficult balancing act but they manage it! Out of the bag the gi fitted even better than their Arte Suave model. The pants fitted beautiful and whilst the jacket was slightly big it certainly was good enough to wear for competition without any problems. This gi is steamed and pre-washed for a more tailored fit so in theory shouldn’t shrink much from washing and retain its shape. As you can see from the size chart there was very little shrinkage with the exception of the body which had some minor shrinkage. But for me this wasn’t really noticeable and if anything helped the fit. Similar to other Gr1ps gis that i’ve worn you really do need to check against the size chart as when they say pre-shrunk they genuinely do mean it! 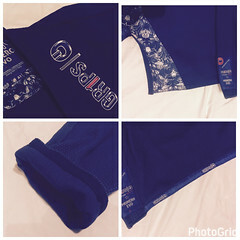 This gi is sold as being fully IBJJF legal and weighs in at around 1.4kg. The Europeans are known for having some of the toughest gi checkers with many well known brands of gi’s being rejected or queried. I have to say that this gi flew through gi check easily which is always a positive making this a definite competition gi for those who need one. In terms of performance it is a solid gi. It fits well and feels good during rolling. The taping on the edging add detail without creating any scratchy edges. 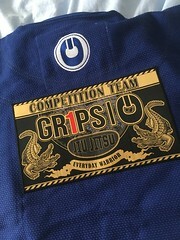 In terms of gripping it matched my other Gr1ps and competition gi’s putting in a strong performance and making it a gi I wouldn’t hesitate to recommend to other grapplers from competition or regular training. Once again GR1PS have produced a solid gi that will be a regular in both my training and competition rotation. Strong performance, great fit and stylish detailing all make for a great addition to any grapplers collection. 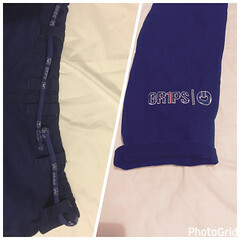 This gi was provided to me by GR1PS and is available online through their shop priced at 119 Euros (around £101 at the time of writing). Although be quick as it often goes out of stock! If you can’t get one directly they are available from a range of stockists including Amazon and Made 4 Fighters.